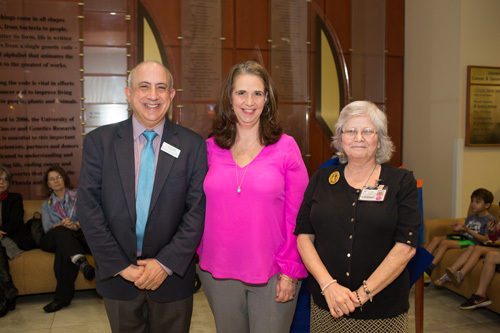 Jonathan Licht, M.D., left, the director of the UF Health Cancer Center, joins Pamela Clevenger, R.N., and Shelly Doran, R.N., right, to celebrate the oncology nurse navigator program being honored with the center’s 2018 Outreach Award. The UF Health Cancer Center earlier this year celebrated the achievements of a program built around patient-centered care. The oncology nurse navigator program — a service that was created to ensure that every cancer patient is equipped with the tools, support and knowledge they need to undergo cancer treatment — received the cancer center’s 2018 Outreach Award. When a patient receives a cancer diagnosis, it can be difficult for many reasons. For one, cancer care tends to be multidisciplinary, meaning patients interact with multiple parts of the health care system that can appear overwhelming and confusing. The role of a nurse navigator is to work directly with surgeons, medical oncologists, radiation oncologists and the imaging team to help guide patients through the maze. 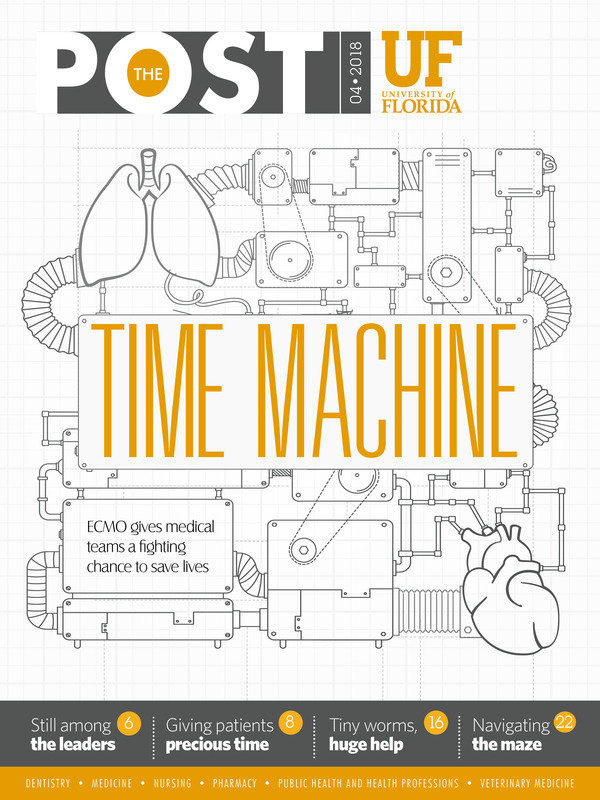 “We really want to make sure our patients do not feel lost within the giant health care system,” said Merry Jennifer Markham, M.D., the UF Health Cancer Center associate director for medical affairs and coordinator for the nurse navigator program. The Outreach Award acknowledges the outstanding effort of a person or team of people in providing outreach and connection to the local community in order to advance cancer care. “We are immensely proud of the UF Health oncology nurse navigator team for their passionate commitment to serving our community of patients,” said Jonathan Licht, M.D., the UF Health Cancer Center director. A navigator is involved with a patient starting from the time he or she receives a diagnosis, all the way through to what is known as the survivorship stage. During this stage, a patient completes a series of imaging that is repeated at six-month intervals for two years, and then yearly. Navigator roles can include helping to find financial assistance, enlisting a social worker to assist with a patient’s case, educating the patient, and identifying support groups for the patient. They also maintain a network of contacts within the community. If a patient lives far away and needs to use resources outside of UF Health between visits, then navigators gather updates from them. Navigators also create and execute patient survivorship plans. It is important for navigators to have an understanding of a patient’s family and develop a rapport. Shelly Doran, R.N., is a urology and genitourinary oncology nurse navigator for the UF Health urologic oncology program. Her patient responsibility is backed by a personal passion: the loss of her brother to colon cancer. Doran finds it rewarding to help patients struggling with a similar illness. She relies on the other navigators to help her develop the best possible advice for her patients. Doran has some patients she speaks to every day, while others might only call her once. It is important to her to always make herself available to people while also respecting their privacy. This role has allowed her to develop stronger connections with her patients, Doran said. A patient might call her to ask if they are allowed to be in the hot tub after surgery. Others might ask for her help on tougher issues, such as finding transportation to the Cancer Center. The introductory phone call that Doran makes to patients typically lasts anywhere from 10 minutes to one hour. Navigation begins from the surgery side and not from the medical specialists’ side. This means patients typically come to see a surgeon first and the surgeon decides who they need to go to next. It leads to a quicker treatment timeline and makes it easier for the radiation team to know if they should set surgery dates. “We want patients to understand all available cancer treatment options and to work with doctors to decide the best course of action,” Doran said. Navigators also collaborate with one another by hosting weekly planning sessions to discuss cases from different medical and/or caretaker perspectives. The navigators also recently attended a national meeting where they heard about the latest research in navigation and convened to share ideas on how to enhance the program at UF Health. Navigators also attend tumor boards, which often cover complex cases. During these meetings, navigators may find a few differing pathways to treating metastatic disease, cancer that has spread to different parts of the body. On occasion, cases involve patients with multiple cancers. “What makes the Cancer Center unique is that patient navigation is based on strong patient relationships and a surgical perspective,” Doran said. “This is because if patients don’t explore surgical options with a specialist early enough, their cancer could become more complicated. Doran wants to develop a pet fostering nonprofit for cancer patients when she retires. This would allow someone to take care of cancer patients’ pets while they are hospitalized.